Every season there are always those key must haves you need to complete your closet. 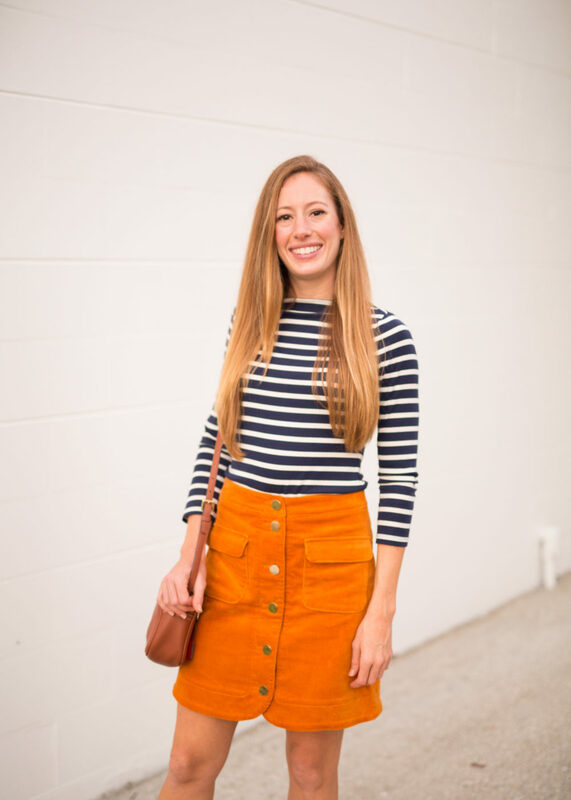 For me, my fall staples this year are a pair of leather boots, a striped top, a leather bag and the oh so trendy corduroy skirt. 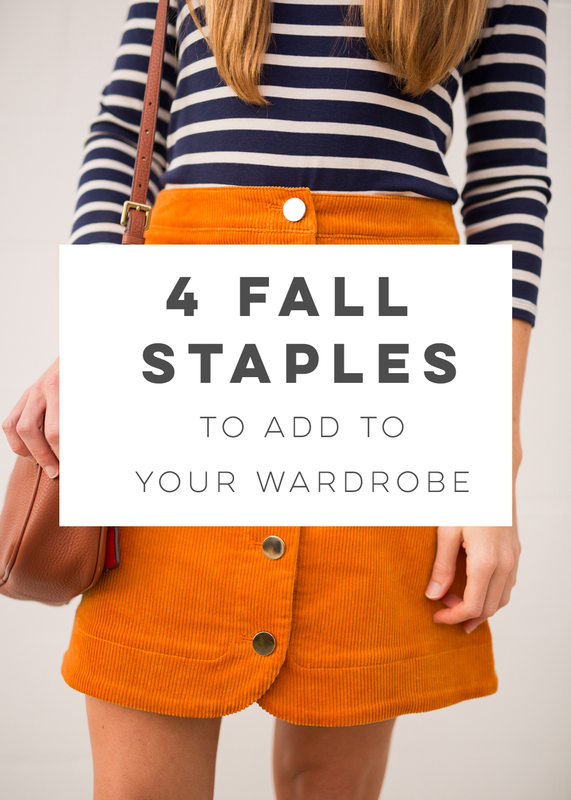 You can mix and match the four items listed below all season long to create endless outfits! To start off, here’s one look out of dozens of possibilities. 1.Striped Shirt. First off is a striped top. 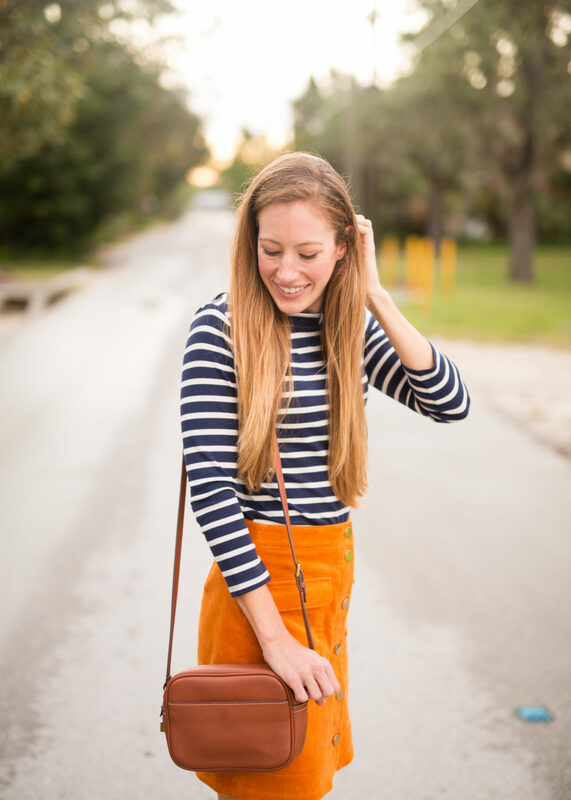 As a stripes fanatic (see just two striped looks I’ve worn here and here on the blog), I can tell you that you will not regret a striped top purchase. I wish you could feel the softness of the Old Navy top. It’s silky smooth and feels so soft you will never want to take it off! It could even double as a pajama top! And that’s saying something coming from this girl who always goes the comfort route! They are great to pair with all types of bottoms. 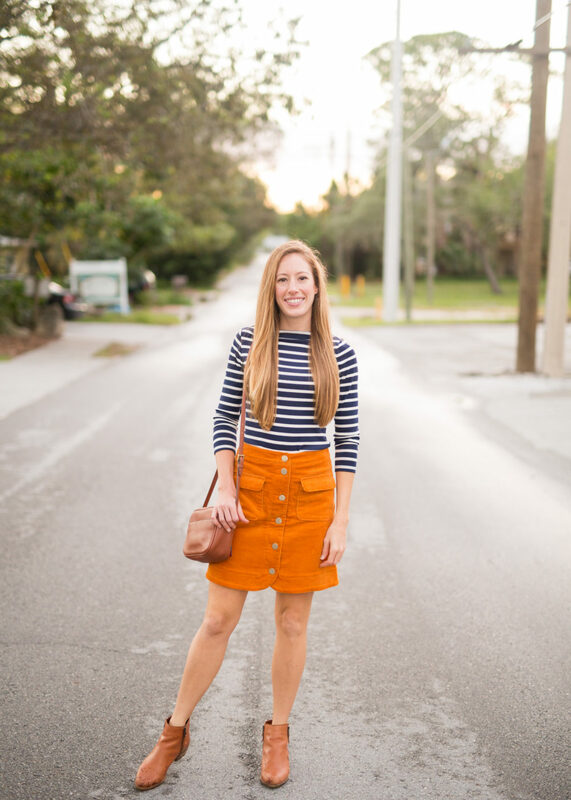 My favorite way to wear stripes in the fall is with with jeans (denim and white) and skirts. It gives you that classic look and you can wear them all season long. Also, you never have to worry about them going out of style. Stripes are here to stay. 2. Leather Bag. 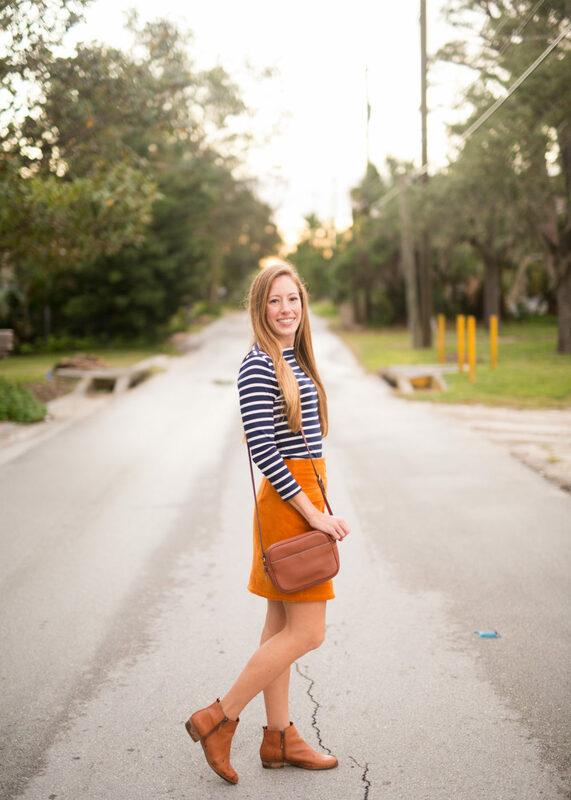 My absolute favorite bag to wear is my leather crossbody bag from J.Crew. I wear it all year round but it get’s the most use in the fall. It’s a neutral so you can basically wear it with your whole fall wardrobe. What’s better than a bag that goes with everything? Secondly, being able to go handsfree is also a major plus. You can wear it walking around town or shopping without the hassle of holding a bag. Shopping with two hands is where it’s at guys! It is an investment but the structure and quality is 100% worth it. If you are looking for a more affordable leather option, this is another bag I love and it’s under $35. Win win! 3. Leather Booties. This is almost a no brainier. You need a pair of simple leather booties in your closet for fall. You can pair them with absolutely everything from dresses and skirts to pants and shorts. Plus, their a neutral, so they match with an array of colors and patterns! These leather booties are by far the best purchase I have ever made They are also the most durable pair of shoes I’ve ever owned. I’ve worn them everywhere from hiking in the mountains to walking on the beach. Tip: After a long day, wipe them off with a dry cloth. They will look as good as new. 4. 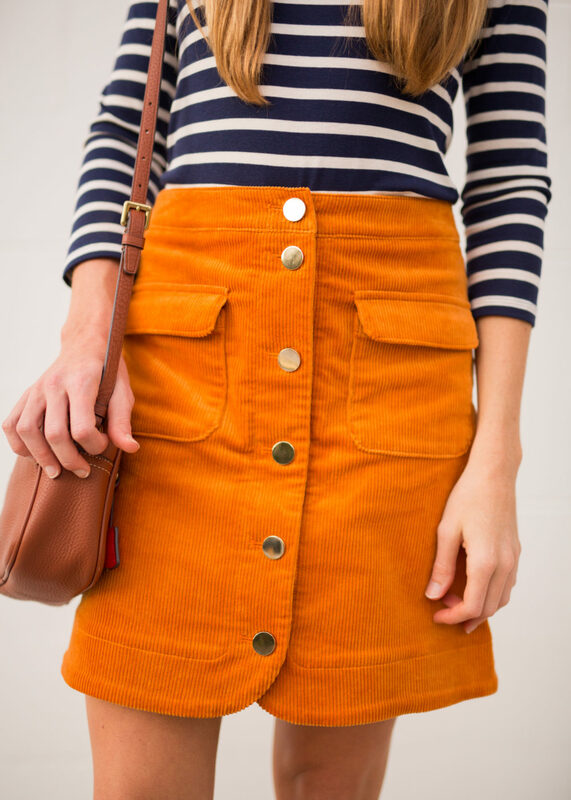 Suede/Corduroy Skirt. 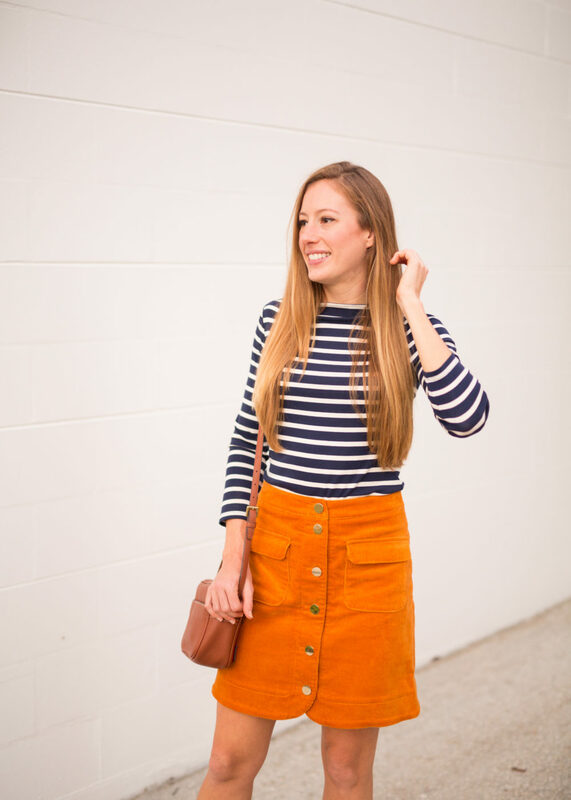 Suede and corduroy have made a comeback for fall! Talk about channeling your inner 70’s child. It’s a fun piece and a trend I was so excited to get behind. After searching for what felt like years, I found this gem on sale at LOFT (similar option here). It’s the perfect length any girl could ask for and the most affordable option of the four fall staples. I found a few similar options under $50 here and here. Seriously, finding a skirt with a decent length should not be as difficult as it is (#tallgirlproblems). I’m a teacher and this skirt is classroom approved for sure. Lastly, a few fun options I adore are this sky blue one and this tan one! 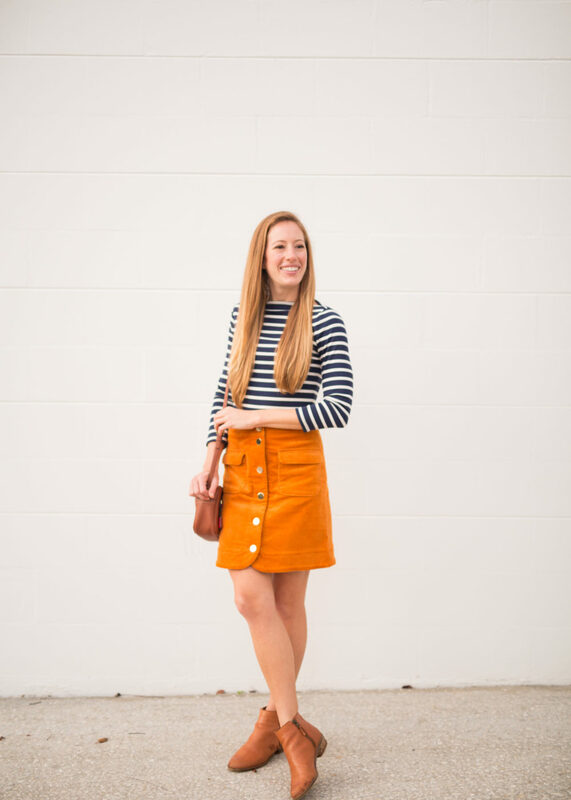 What are some fall staples you have in your closet? 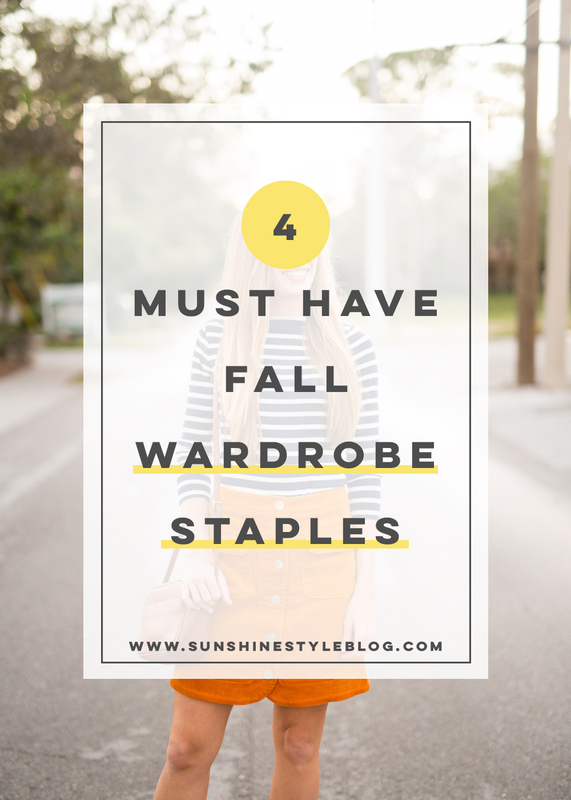 Let me know in the comments what fall staples you plan on adding to your wardrobe this season! Absolutely love this outfit!! 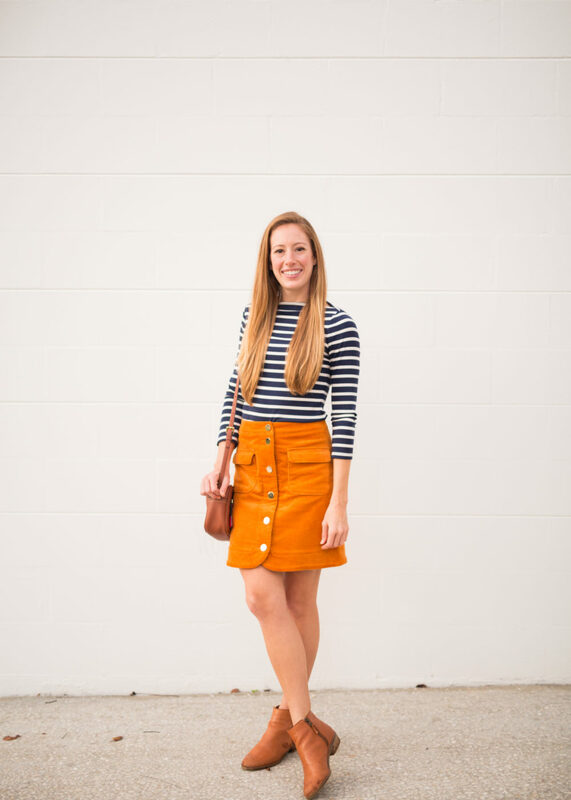 Navy and orange, or navy and mustard are my favorite color combos. So classic and perfect for this season! I’ve been in the market for booties, but I have no idea what I’m looking for. I’m definitely going to check out your suggestions. Thanks girl!!! There are so many good boot options out there right now! You are bound to find a pair that fits your style! Let me know which style you end up buying! If you want me to look for a certain type, let me know! Online shopping is my specialty. You are SO cute and this outfit is adorable!! I love love the colors! That skirt is adorable! Love this outfit on you—so cute. Girl, I can’t stop wearing the skirt! 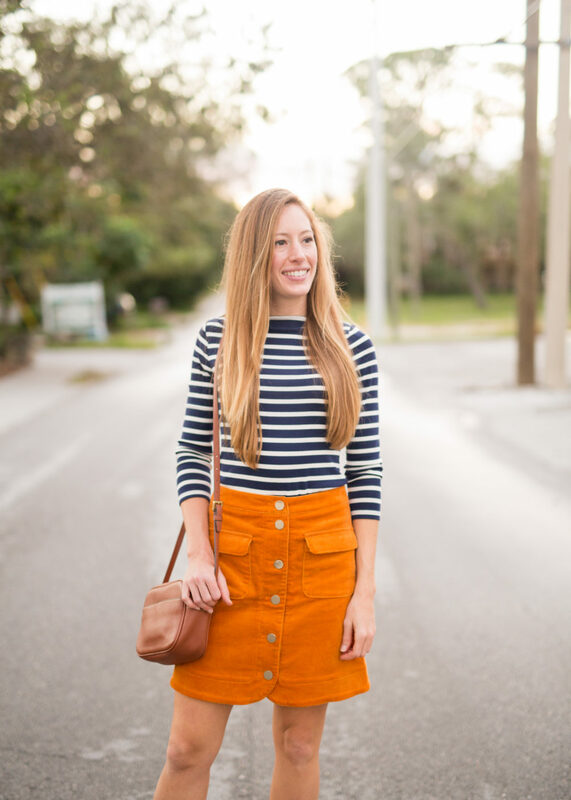 It’s so easy to style for fall. Thanks for visiting Aubry!